Home › Plantar Faciitis › The Plantar Fasciitis Trials – Part 4 – the excuses. The Plantar Fasciitis Trials – Part 4 – the excuses. 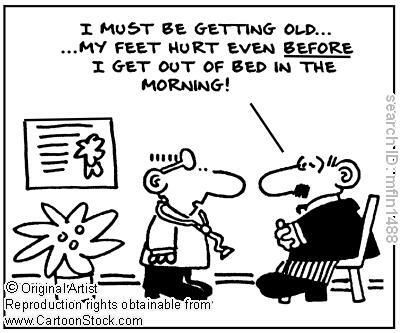 Who knew there were so many foot pain comics out there? Footlog – the Doctor loved this. The Stick – Because it is awesome. Orthotics – because he is a podiatrist. And I was willing to try it. While my desire for an insta-fix was (expectedly) dashed to the ground, having a goal and a direction that would resolve my issues was fantastic. The podiatrist had warned me that this might be a long process, and lets be blunt here. Considering the lack of flexibility when he tested my ankle? This (unfortunately) made an incredible amount of sense. So, a couple of things I did right off. I knew my Orthotics weren’t going to be ready for approximately 4 weeks – so I went out and got some blue ones from Dr. Scholls. This combined with the Arch strap did give some immediate relief. I was cleared to try running fairly quickly after my Doctor’s visit – but my shoes hadn’t arrived and I wasn’t willing to attempt to run in the shoes that had contributed to my problem. Not wanting to lose my fitness level – I attempted other workouts (Insanity), but I have to admit I only lasted a week or so at it. I have an unfortunate problem when it comes to exercise. The problem is, I’m a runner. I like to run. I can put up with other exercises – if it helps me run better, but if I’m not able to run it probably won’t last too long. I know it’s a will power thing and something I hope to never have to face again. If so, maybe this time I will beat it. But that’s a whole other story. The Insanity lasted about a week, then it all got side lined when my Mother In Law had heart surgery. I ended up with two weeks off of running and exercising, and my Plantar Fascia didn’t improve much. I even tried KT tape instead of my old taping method (not as useful as I had hoped. It actually hurt worse afterwords, though I’m not blaming it. I suspect that there was something else, and the KT tape simply didn’t have the same level of support as the other taping method.) I wore the Nightbrace, used the stick and footlog and iced. Periodically, I would try running again, try to convince myself it wasn’t really hurting – then when the truth set in, I would cut back on running and mix in some other exercise as well. Overall, the pain was staying with noticeable pain but at levels that I was able to function at – even if it did hinder my desire to run.. Honestly, I was terrified that I would run for more than a day or two and bring back that absolutely excruciating level of pain I had been at. It kept me from really trying to start running again for real. Through out this time (probably up through end of June), I was continuing to stretch my calf using the stair stretch, take Ibuprofen and ice it. But I wasn’t doing much exercise. Then I went for a Job interview in Maryland. In July, they called and offered me a job. Ok, at this point any form of exercise went away as we began to prepare our house to sell, and very quickly (as of August 1st,) I was spending Sunday night to Friday morning living in a hotel. This had a definite advantage of easy access to a treadmill – so I began doing 2 mile increments on the treadmill, once or twice a day. 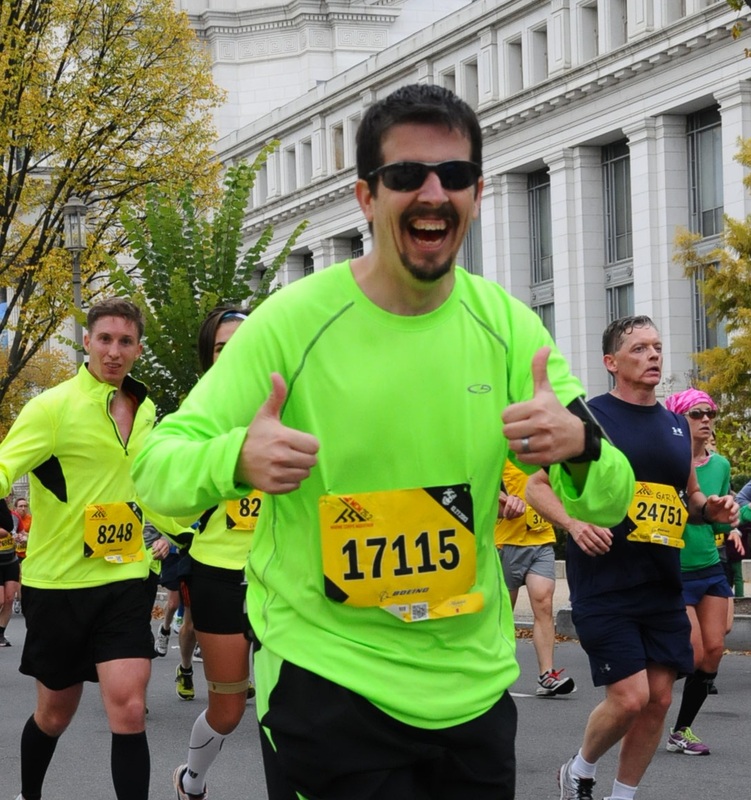 I had hopes that I could still pull off running the Marine Corps Marathon in October (mind you this was August 1st, and I had done no real running since the end of March.) Needless to say – if my family was going to move down ASAP, my focus needed to be on finding a place to live. With that accomplished, my family moved down Sept 15, 2012. Through out this I continued to stretch my PF, and it maintained a fairly steady level of throbbing. No sharp pains, just dull and constant. I was un-able to run the Marine Corps Marathon (and had no business considering it anyway), but I did start my running back up. Other than 3 weeks since Sept 14th, I have run every week. So where am I now? My Plantar Fasciitis still aches, but I haven’t had “Sharp” pain in a long time. I still pay attention to whether it lowers or gains. I wear shoes with orthotics all day throughout the week and until very recently – have done all of my running with orthotics in my running shoes. I just recently tried short runs in the VFFs, and wearing them walking around on the weekends (at first with my Dr. Scholls inserts, now I am trying without.) I have been varying my footwear as much as possible, as I try different things to see what makes my feet ache more, and what makes them ache less. Without a doubt, the biggest contributor to it now – is the shoes I wear every day at work. They are a marvelous-looking pair of Docker dress loafers, that look fantastic whether I wear a suit, or just a tie and sports coat. Unfortunately, I have been unable to find any dress shoes that do NOT make my Plantar Fascia relatively unhappy. I’m currently watching what is happening with the “Primal Professional” – a barefoot dress shoe. Even if I put my orthotics in them, they will be a relatively low-rise and more spacious shoe, which should cause me far less discomfort. These have the largest advantage of looking like a conventional dress shoe WITH a heel – even though the heel is actually fake. There are however two major down points. The first one – they aren’t available yet. The second? They are $350 a pair. I am also considering the Vivobarefoot Ra – but I don’t think it looks dressy enough. My wife and I have totally changed our diet as well – with a large increase in vegetables. I mention this, as I have been doing a wee bit of reading on how a crappy diet can interfere with your body’s ability to heal itself. (Living in a hotel for 6 weeks, you don’t think I was eating well do you?) Some of the better meals will be posted here! Once I have 3 or so, I may even add a “healthy recipes” tab at the top of the blog next to Product Reviews. In addition, since many injuries are caused by bad-form, I have been in contact with Tracy Peal up in Pennsylvania, who is a Level 3 Certified POSE instructor. Since I have thus-far been unable to find a clinic I can attend, I am hoping to schedule a session with him and improve HOW I run so that I can run better, and stop getting hurt! I think I am on a fair path toward not only fixing this issue, but trying to prevent my “injury of the year” trend. This year, I WILL be running the Marine Corps Marathon. let me know how being a Barefoot Professional works out. I think that’d be kinda awesome. And I am thrilled to hear most if not all of your major pain has gone away. Keep that up! Oh, YES, your fuel matters in regards to pretty much everything including faster healing. Think lots of dark leafy greens such as kale and collard, other cruciferous veggies, beans, fruits (especially berries), mushrooms, onions, garlic, nuts (such as walnuts), and seeds (in particular freshly ground flax).